Clark Crawford, a Nashville native, graduated from Hillwood High School in 1974. Clark has been a competitor his whole life, playing and winning in Tennis, Golf, Baseball, and Football. He found his true passion; racing motorcycles, at the young age of 14. In 1972 at The A.M.A Kentucky / Tennessee State Motorcross Championship he finished 3rd out of 52 riders. It was this early experience that ingrained the importance of preparation and the personal dedication necessary to be a winner. Two wheels were just the beginning; ultimately four wheels were what held the real challenge in the future for Clark. Clark began racing in local autocross events driving a 1972 Datsun 240Z. He began repairing Datsun’s professionally at the age of 20. After working 3 years for Hippodrome Oldsmobile/Datsun, he was inspired by a fierce sense of independence and the belief that customers desired more than the dealerships were delivering.. April 1978 Clark opened Crawford's Z Car Service Inc, dedicated to the service and care of the Datsun Sports Car and it's owners. 1979 Clark converted his 240Z Autocross Car into a C-production Road Racing Car for the Sports Car Club of America. 1981, his Rookie season as a National Driver, Clark won both races at Road Atlanta against notable drivers. He got an invitation for the Championship Race, the Champion Spark Plug Road Racing Classic - The Runoffs at Road Atlanta. Being a dark horse pick by Sports Car Magazine he qualified sixth out of a 21 car field. Starting his first rain race, he finished twelfth. 1985 Clark built a Timmons Tube Frame GT-2 280ZX. He placed third at The Valvoline Championship Runoffs at Road Atlanta after qualifying seventh. 1986 his first professional race competing in IMSA - GTU he finished ninth out of 21 cars with his SCCA car. 1987 Clark teamed up with friend and fellow SCCA competitor Harry Gershenson, owner of The Z Shop of Miami. Crewing and co-driving in the IMSA-GTU class at Miami, Road Atlanta, West Palm Beach and Lime Rock was a learning experience for both drivers. 1988 Clark sold a successful business and race car to pursue a professional racing career, which was another learning experience. From 1992 – 1996 he was the service manager for Bloodworth MotorSports, a European repair shop. During this time he began racing Jet Skis and was a race promoter.. In 1995 he married his best friend of 16 years, Jo Anne. September 1996 they opened their current business Z Cars by Clark inc. dedicated to the service and repair of Nissan’s and Infiniti’s and specializing in the Z sports car. Clark and Jo Anne enjoyed riding their Sea Doo’s during the summers. They entered the inaugural “Tennessee River 600”, June 1997. There were 125 water craft that left Paris Landing, Tennessee for a casual cruise thru 5 locks on the Tennessee River. They rode 600 miles in 6 days to Neyland Stadium in Knoxville, TN. What a beautiful and challenging ride. Clarks’ expertise in engine repair came in handy for quite a few riders. They met a lot of nice folks enjoying the outdoors. Keeping an open mind for a racing opportunity, local business man and owner of Ebbtide Boats, Tommy Trabue called. To make a long story short, Tommy, who is good friends with John Morton, bought Brad Frissells’s fully restored 1970 Datsun 240Z IMSA/GTU car which won both the Drivers and Manufactures championship in 1974, defeating Bob Sharp and all the Porsches. The car was on display in the Peterson Museum, Los Angeles, CA. for 7 years when Tommy purchased the car from Brad. Clark prepared and co-drove the car with Tommy in the Historic Sports Car series. They only raced the car once a year at Road Atlanta, The Walter Mitty Challenge, from 1999 to 2006. Tommy sold the car in 2006. For the next 3 years Clark was a driving school instructor at the Nashville Super Speedway for NASA and Phil Wicks Driving Academy. 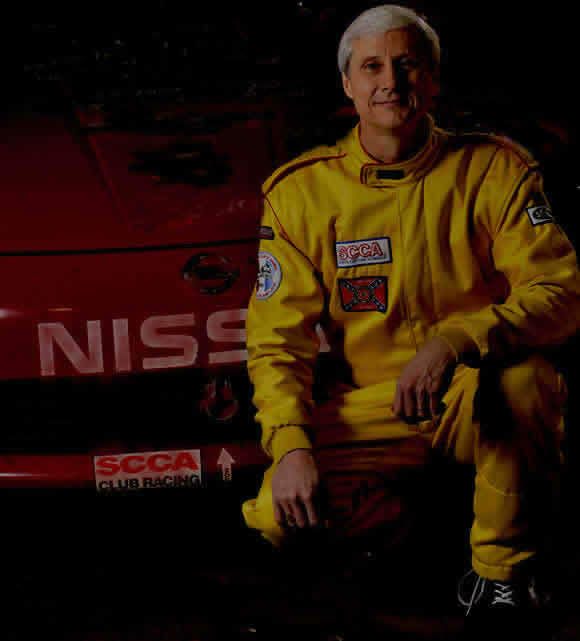 February 2008 Clark purchased a SCCA, Touring 2, 2003 350Z regional car to compete on a national level. The commitment was challenging but by the end of the 2010 season perseverance was showing results. Lap times were 2.5 seconds faster at Barber Motor Sports Park from last year.